Do you give yourself a pat on the back whenever you manage to keep the home clean for a longer stretch of time – longer meaning a measly span of several hours? Then you must be growing increasingly frustrated with household chores piling up. Perhaps you’re also irritably wondering whether professional Brentwood house cleaners have some sort of superpowers! If you want to know how to clean house fast and easy, whether because you’re expecting a house full of party guests or are just weary of living in a constant mess, here are some quick tips to help you get organized! The thing with house cleaning, even if you hate it, is that, once you get started, you feel the sudden urge to do it properly. You’ll get frequently distracted and feel utterly exhausted 15 minutes into the process, having spent so much energy paying attention to the tiniest details. We all know the outcome – either you give up right away or you lose motivation and it takes you forever to finish it up. How to clean house fast and easy step 1: toss it out! Make sure you have bags, boxes or baskets ready to fill with all the stuff that’s out of place throughout the house. Grab a trash bag and do a room-by-room scan. Throw away anything that serves no useful purpose – newspapers, old receipts, food packaging and the like. Don’t overthink it – be efficient and declutter. Move all the dirty dishes into the kitchen sink – or the dishwasher, if there’s room left. You don’t need to wash them just yet. The Internet has been abuzz with the talk of ‘throw away, put away, give away’ principles, which are a smart way to sort out miscellaneous items which happen to be lying around the house. This step means having to take each item that doesn’t belong in a certain room and return it to the room where it belongs – even if it means making an ever worse mess in, say, the bedroom. Once you do this in all the rooms, you’ll realize how thorough and efficient the approach is. Take care of sweeping, vacuuming and mopping after you’ve cleaned, that is, wiped down all the surfaces. This makes it possible to do a thorough job without having to go back and forth all day long. Well, it’s not exactly cheating if you’re going to get round to dealing with the task at hand eventually, but bend the rules a bit. If you’re really pressed for time, hide the hamper with the dirty laundry and that pile of clothes that you were going to go through and see what to get rid of but haven’t had the time. However, make sure to put each task that you’ve put on hold on a to-do list and do it whenever you find the time. How to clean house fast and easy? MaidThis offers the fastest, easiest answer! MaidThis can match you with the professional house cleaner of your dreams – someone to make your home look impeccably neat and clean. Let MaidThis match you with a superb cleaning service and make your home a happier place. We are absolutely confident it will be a weight off your shoulders, so call us today! 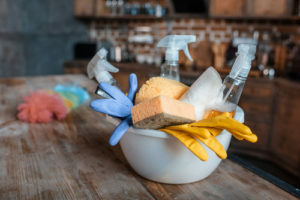 How To Deep Clean Your House In One Day?